Old movies are good for you, like chocolate eclairs or a trip to the spa. You should never let a week go by without enjoying at least one of these. Our purpose with this blog is to sell you on these older films, to show you why they’re so entertaining. We’re not offering an in-depth analysis of these films and their effect on society. We’re just in it for the fun. We hope you’ll come to love these old movies as much as we do. Bonus Trivia: Silver Screenings is the name of a fictional movie-fan magazine featured in the delightful 1922 novel Merton of the Movies by Harry Leon Wilson. We believe the images on this website fall under Fair Use, yet we try to give credit for images whenever we can. If you feel we are violating copyright with any one of these images, please let us know. If your spa doesn’t serve eclairs, then it’s time to change spas. thanks for the follow! I ‘ve had a look through your blog and like it! I’ll follow you form here as well. Thanks again! Thanks for dropping by my little piece of the blogosphere. I like what I’ve seen of your blog so far and I’ve a feeling it’s going to become very popular. I’ve nominated you for the Beautiful Blogger Award. If you choose to accept it, the rules are listed in my post at http://anotherlovelyday.wordpress.com/beautiful-blogger-award. Thanks – and Im REALLY looking forward to more of yours! Your food ideas are going to make me look like a hero! Hey, I really enjoy reading your blog so I nominated you for the Inspiring Blog Award! If you want to participate, you can check out my post here and follow the steps! Ruth, I’ve nominated you for the “Family of Bloggers” Award. To see the nomination, visit http://anotherlovelyday.wordpress.com/2012/12/13/overdue-thank-yous-awards-and-a-little-winnie-the-pooh. Thanks, Sandy! That is very sweet of you! I saw your comment on my blog and yes I still have spots left for my be my guest series. Can I put you down for October? 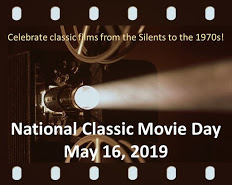 The word “classic” is thrown around much too often these days- such as “American Movie Classics” (AMC, which is now just another mass marketed channel that butchers movies). To me, and many others, “classic” isn’t 70% of the movies shown on AMC. I used to watch FMC (Fox Movie Channel) but even they are starting to go down the same road as AMC. There’s nothing more frustrating than watching a movie that is constantly interrupted by commercials. That’s why I think Turner Classic Movies is one of the best channels ever. As for the word “classic” – yup, it means different things to different people. This is one of the things that makes the classic movie blogging community so interesting. You should give it a try! With this award comes great fame and riches and buckets of champagne. Okay, not really but I love your site and I think you rock! Keep up the great work! Wow! That is so great! Who doesn’t love buckets of champagne? I love classic movies! So glad I found your site. Thanks for dropping by! I hope you’ll find some films that will become new faves. I have been addicted to classic films since I was a kid! My favorites are from the early thirties. Anything with Clark Gable, Jean Harlow or Fred Astaire makes my day! Me too! Gable, Harlow and Astaire became legends for a reason. Thanks for dropping by. Oh dear – would it be OK if we moved you to May 5th? If that doesn’t work for your schedule, we will put you in the 6th. Thanks! How incredibly cool, Ruth! Your post makes me think of when my husband Vinnie and I went to California for our honeymoon back in 1989! Thanks for sharing your memories, my friend! How delicious to find You. I love your blog and I was wondering if you’d be interested in co-hosting a blogathon with me? Hi Rosie Alaska! Yes, I love to if it could be a 2-3 day event. What kind of topic did you have in mind? Would a 1967 theme work or is that a bit too recent to fit with your classic films theme? If so, we could do 1939? I was thinking maybe late June, if that works for you! I think 1967 could work well, since it’s such a momentous year. A lot of classic movie bloggers don’t cover films past 1967, but I think many would be interested in exploring this year in film. Let’s do it! Late June sounds perfect to me. Perhaps we can discuss this in more detail via email? I’m 925screenings [at] gmail.com. I just wanted to let you know about this special event (their 50th annual film festival) of rare and rarely seen old movies. I hope you can do a story on Cinecon and their 50th Annual Film Festival this Labor Day Weekend (Starting August 28th through September 1st, 2014. These are film fans who love the rare and rarely seen movies, silents and early talkies. The movies are mostly 35mm film, not digital films shown on the big screen (the historic Egyptian Theater in Hollywood) with an appreciative audience. There is live musical accompaniment for the silent films, including at 1925 John Ford directed film entitled Kentucky Pride. (a list of some of the movies is below). Thank you for any assistance in getting the word out to your Silverscreenings.org readers. This is a non-profit organization with monies going toward film preservation (yes, they have preserved films) http://www.cinecon.org/cinecon_filmpreservation.html. Please let your friends who are interested in old film movies know that they can come and explore the 50th Annual Cinecon film festival Labor Day Weekend in Hollywood (Egyptian Theater), and the movie memorabilia sale at the Loew’s hotel (the guest hotel). This has been going on for 50 years. Taking place in the heart of Hollywood, Cinecon is a five-day celebration of film featuring screenings, celebrity guests, and one of the best movie memorabilia shows in the country. Next Labor Day weekend, beginning Thursday night, August 28 and continuing through Monday afternoon, September 1, film fans attending the show will be treated to nearly fifty rare features and shorts, and have an opportunity to purchase rare stills, posters and other collectibles. We specialize in running rare, unusual and unjustly forgotten movies from the silent and early sound era. Most films are screened in 35mm and silent films include live piano accompaniment. Cinecon is truly 7th Heaven for Cinephiles who have seen nearly everything TCM and AMC have to offer. For nearly fifty years, Cinephiles from across the nation and around the world have come together over Labor Day weekend to celebrate the movies. Over 50 films (most are 35mm film not digital) will be screened on the big screen at the Egyptian Theater in Hollywood from September 28th through Monday early evening September 1st. Most of the films are rare and rarely seen. Here are some of the titles scheduled for this years show. More films to come. Cinecon strives to bring film fans the opportunity to see the latest film restorations from archives and Hollywood studios, and we are especially pleased this year to be able to present the Constance Talmadge film East Is West for the first time on any American screen since its 1922 release. Recently restored by the EYE Institute of the Netherlands, East Is West is based on a play written by Samuel Shipman and John B. Hymer, which opened Christmas day 1918 in Manhattan’s Astor Theater, and by the standards of the day was a tremendous hit, running for nearly two years, and racking up 680 performances. The play starred future movie character actress Fay Bainter in the role of Ming Toy. Betty Compson plays Confederate raider Belle Starr in Court-Martial, a tale set in the immediate aftermath of the American Civil War co-starring Jack Holt. Gloria Jean, Robert Stack, and a host of policeman “uncles” played by some of the silent screen’s leading stars, including Charles Ray, Maurice Costello, Monte Blue and William Desmond. Directed by Andrew Marton. A truly unique silent screen comic was Raymond Griffith, whose inability to become flustered when confronted with disaster made his screen persona both familiar and unpredictable. Paths to Paradise is part Trouble in Paradise, part Cops, and all fun. Betty Compson is the “Queen of Crooks”, and Griffith is the “Dude from Deluth” in this hilarious tale of crook vs. crook Directed by Clarence Badger, and based on the 1914 play Heart of a Thief by Paul Armstrong. Based on Ayn Rand’s 1935 mystery play, this was directed by William Clemens, who helmed the four Bonita Granville Nancy Drew pictures. Robert Preston, Ellen Drew and Nils Asther take the leading roles. A screwball follow-up to 1941’s Moon Over Her Shoulder, this film pits a hapless husband against his super-efficient wife. Resentment leads to infidelity, divorce proceedings and (believe it or not) murder! Lynn Bari, Joseph Allen, Jr., Mary Beth Hughes and Nils Asther star in this oddball comedy directed by Robert Siodmak. Twenty years after Paths to Paradise, Paul Armstrong‘s play Heart of a Thief was remade starring past Cinecon guest Eddie Bracken and Veronica Lake as the wayward thieves, with director George Marshall, at the peak of his comic powers, calling the shots. Rita Cansino (soon to become Rita Hayworth), Claire Trevor, Ralph Morgan and Brian Donlevy in Human Cargo, directed by Allan Dwan. Based on the 1936 Austrian play, Jean, by Ladislaus Bus-Fekete. The Baroness and the Butler has William Powell as Johan Porok, butler to Hungarian Count Sandor (Henry Stephenson). He gets elected to parliament on the social progressive ticket, even as he vows to maintain his position as a gentleman’s gentleman. Joseph Schildkraut co-stars, and Anabella plays the spoiled baroness. Blackmail, suicide, murder, a cover-up not to mention yachts and sea planes all wrapped up in an efficient 66 minutes of screen time with Henry Hunter, Polly Rowles and C. Henry Gordon in the leads, and Lewis R. Foster sitting in the director’s chair. A rarely screened William S. Hart Western, and, from all reports, one of his very best. Hart plays a mysterious stranger, in love with a preacher’s wife, who takes the blame for her husband’s crimes. Directed by longtime Hart associate Lambert Hillyer, Travelin’ On also features Ethel Grey Terry, Brinsley Shaw and James Farley. Three years before his long-running radio show really hit its stride, the full-blown character for which Jack Benny would be remembered was in evidence for the first time in this delightful comedy musical, also featuring Ellen Drew, Phil Harris, Dennis Day, Andy Devine and Eddie “Rochester” Anderson. In her screen debut, ice skating star Sonja Henie is surrounded with a top-notch supporting cast, including Adolphe Menjou, Arline Judge, Jean Hersholt, Ned Sparks, and Don Ameche. What more could you ask for? The Ritz Brothers? They’re on hand as well! The first screen version of Mark Twain’s classic novel about an ingenious New Englander who is transported back in time and place to the days of King Arthur’s England. Starring Harry Myers. Director John Ford and screenwriter Dorothy Yost put audiences through their emotional paces with this “kitchen sink” drama that includes just about everything that can happen to a horse in a horse racing movie and still end up with a happy ending. Henry B. Walthall and Gertrude Astor star. As always films are listed here pending final clearance and are subject to change. As a teenager I used to love spending Saturday afternoon curled up in front of an old B&W movie. We only had a few TV channels in those days but they showed some good stuff. I especially liked watching Cary Grant, Bob Hope, Fred Astaire and Danny Kaye. Nice to meet you. Thank you for visiting my blog – I’m looking forward to reading your reviews of classics. Hey there, I’ve nominated you for the Real neat blog award, Go ahead and accept it, and if that’s not possible then I’ll completely understand. Thank you very much! Woo hoo! Oh right! Doh! Thanks – will change it. I’ve made the same mistake myself on occasion. They are, aren’t they? The Beach Blogathon is already too much fun! Greetings and salutations! I’ve nominated you for a Liebster Award. Take it if you want to. And I’m enjoying and learning on your site.. Thanks ! Great idea for a blog… Can I ask where you are getting access to the films? Is there a must-have collection of DVDs where I can get a whole bunch in one go? (Legally, and with money, of course.) I love old movies, but don’t know where to find them anymore! Youtube is a great place to watch old films. A lot of them are obscure and many of them aren’t remastered, but they’re still fun. There’s also a selection on NetFlix, and Warner offers a streaming service as well. Because I have a weakness for old movies, I do own quite a few DVDs. Helps a ton! Thank you! It’s my pleasure to recommend your fascinating site. Like Sarah Vernon and Vickie Lester, you know what you are writing about and you love what you know without being dazzled or sentimental about it. Hi! I was unable to leave a comment on your announcement post, but please sign me up! I’d like to do Barbara Bel Geddes in Caught (1949). That would be fantastic, thanks for joining in! Awesome! Thank you. We will include you in tonight’s recap. Thanks. and great being involved, keep me posted re other blogathons! Sorry to be a pest but need to change it again – this time (and def the last time) its J.R. Ewing (Larry Hagman) from Dallas (the orginal series), Just finished writing it so wont be changed!!! Ok, I’ll let Speakeasy know. The Day 6 recap is posted on the site. Have a great weekend! Oh dear! Sorry! Thanks for clarifying. I will fix list when I return next week. Yup, it is the same. Ah! My childhood hero! Please may I join with The War Wagon and Big Jake? Can’t wait for the Dual Roles Blogathon on Friday! My post is patiently waiting to be published….am so excited! No problem at all! Glad you were able to sign up. I’m looking forward to your post on The War Wagon and Big Jake. It’s been a lo-o-ong time since I’ve seen Big Jake. It’s been just as long for me. For both movies! Have a great day! Hi there. Just wanted to thank you for your guest appearance. It’s a really great review and you’re welcome any time. Here it is. Thanks very much! I will link to it later today. Thanks so much! Am out of town (and without laptop) this weekend, but I’ll check it out next weekend. Yay! I just followed your blog; I look forward to reading more of your articles. My name is Tiffany Brannan, and I started the Pure Entertainment Preservation Society, https://pureentertainmentpreservationsociety.wordpress.com. We are trying to bring back the Code of 1930 since we love old Hollywood so much. I hope you will look at my column and follow. Thanks for the link! I’m travelling over the next several days, but I had a quick look at your fab site. Will be back to read more in depth. I have nominated you for a Sunshine Blogger Award. Here is the link to the article about it on my website: https://wordpress.com/post/pureentertainmentpreservationsociety.wordpress.com/2774. I’ll be by to check it out. Thanks! This looks like fun! I am working on my banners for “The Great Breening Blogathon,” The Flapper Dame was going to be my co-host, but she had to resign. I have never made banners before, and I am struggling. I am trying to use GIMP, but I am running into problems. Can you offer any advice? Is there another program which would be easier to use? Thank you very much. Hi Tiffany, if you can wait until next week, I’ll be happy to do the banners for you. I use Photoshop, which makes the whole process very fast. Please send me the photos you’d like to use, the info (dates, etc), and your basic design ideas and I can do them next week. You can email me at 925screenings [at] gmail [dot] com. Thank you very much for your kindness and generosity. Fortunately, I was able to find another program, and I finished the banners myself. I would love to have you join the blogathon: https://pureentertainmentpreservationsociety.wordpress.com/2017/09/07/extra-the-great-breening-blogathon/. We could really use your talent! Good luck on your Movie Scientist blogathon. I will send my contribution very soon. My blog is super random. I review movies both old and new, but I’ve seen many classics. It’s good to meet you as well. I’ll be by to visit your site next week when I’m back home. Have a good holiday. I look forward to your visit. I’m very pleased to hear you like old movies. There are so many really good old movies. Hi Ruth. Hope you’re well. I wanted to contact you to ask if you would like to co-host a blogathon with me? I’m glad to know you’re a fan, too. Old movies are my “comfort food”. Should I apply officially then? Superhappy you doing this blogathon again…. Oh no, don’t worry about it. I’ll include your choice in the announcement post. You’re good! Thanks! Looking forward to this. Hi! I’d love to share my story on your website. You probably have a long waiting list of bloggers, but I’d love to jump in at any time. How does it work? Would I send you the info in an email or Word doc? Hello, I have started my first ever blogathon if you are interested. This sounds wonderful. Count me in! I’ll drop by your site to sign up. Woohoo! I’m in, baby! I’ll drop by later with my choice. Thanks for the invite! Awesome!! Welcome back to the blogathon! Hey Ruth. How are you going these days? I’m wondering if you would be interested in joining my Fourth Annual Bette Davis Blogathon? Here is the link. Yeah there is another blogathon around the same time. I’m not sure if I will have the time to participate in that. Just a heads up. I will be announcing another blogathon Tuesday.